So, you don't want to see all my pretty camos? Well, I got one for you! And it's all historical, so you HAVE to see it! Edited by DeviouslyCursed, Feb 12 2019 - 05:55. So you think there are people who really, really care what the heck color your pixel tank is tinted? K then. Carry on, if it makes you happy, to stick it to them! Not very nice of you to make them lose so much sleep though. I used santa and the girls to crew my spagetto 46 since I had no italian tanks. Am I a bad person too? Terrible reading comprehension , and you were not being addressed. You do realize no one will take you seriously ... actually prolly not. So now you know. Congrats, your tank looks like crap. I think it's a self-inflicted wound. So why is having claus in the SConq a bad thing? Or are you just too shortsighted to see past the present? Guess it does take all types for this world. Fear mah Green and Red tank! Edited by DeviouslyCursed, Feb 12 2019 - 15:27. Sure, be glad to explain. First, I didn't say Super Conq. I said Caernarvon. It was more of an insult to the Caern really. But we can continue under the premise that you put Claws in the Caern with the ultimate goal of getting him to the Super Conq, which is really an outstanding tank, of course. The 0-Skill crews (and in Claws case, a double 0-skill crewman) should best utilized in tanks where that high number of skills can be best utilized. For example: would it make sense to use a 0-skill crewman in a tier X heavy tank to get your radio operator to 6 skills so he has the signal boost skill? No. Of course not. The max skills the Radio Operator would need is around 4 or 5, as the signal boost skill is completely worthless at tier X. It would be a waste of a good crewman to put him in that slot. Likewise, does an arty driver need ramming skills? No. Does an arty loader really need firefighting skills? Nah. If an arty is spotted, he is dead anyway with 1 or 2 shots, fire is not really the fear. By extension, the tanks where these crewmen can make full use of their extra skills are usually light tanks and mediums, to be more specific, usually commanders and drivers. Claws, of course is locked into the Commander role. Next: There are several nations where you should never place your reward crews (like Claws and the female crews). These include: Russia, Germany, USA, and in this case UK. Why? Because those nations have tanks regularly offered to us with 0-Skill crews in them for purchase. You should focus your reward crews into nations where there is no other chance at 0-skill crews. Clearly, you spend money on this game, so simply buying some good crews for your UK tanks when the Cromwell Berlin is on sale is very much an option. Putting Claws as a commander of a fantastic heavy tank is an ok choice. There are just much, much better options. 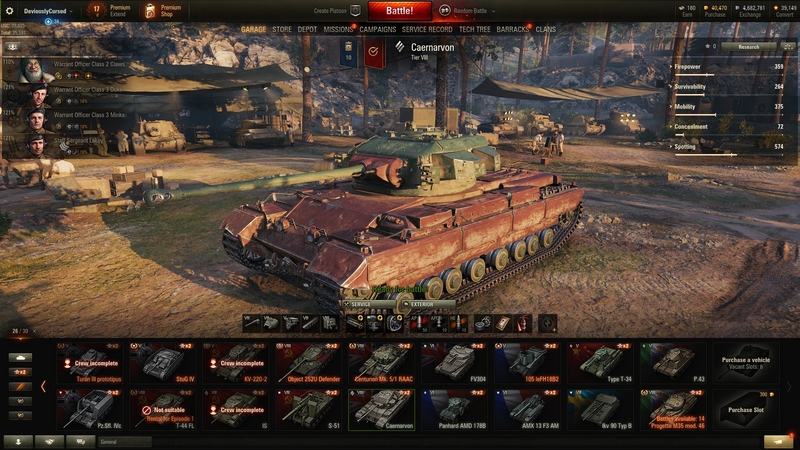 With its recent buff, the Caern is a hidden gem at tier 8. As the OP's highest non-prem tank, it makes perfect sense to use him there. Now keeping SA on the commander with a tank the loader is the radioman despite having 40k gold for retraining is a bit of a mystery. Ok, you've made a decent point. In fact, if I had been going down the UK medium line, I would have used him there. But you see, Claus HAD to go into a UK tank. Why? Because most of my commanders are female (or will be eventually). And I absolutely detest the British female voice. 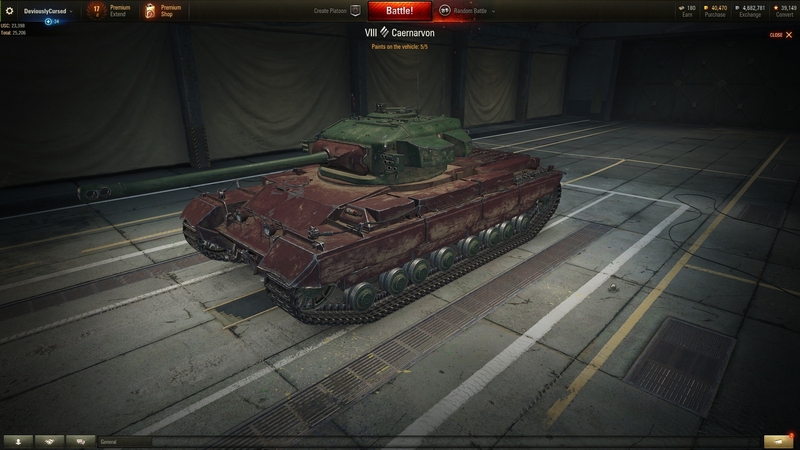 So Claus was going into a UK tank, and so far the only 2 lines I'm doing are Heavy and Arty. So Heavy it was. Edited by DeviouslyCursed, Feb 12 2019 - 18:31. Wow, I had no idea their roles switched when I moved them from the BP (which I thought was a pretty good tank, don't know why people hate on it so much). I fixed it. You have some serious attention to detail there. But thank you for bringing that to my attention. Edited by DeviouslyCursed, Feb 12 2019 - 18:39. Namely because she shares a tier with monsters like the t29, and the O-ni. Her armor, pre buff, was paper and many players formed their opinions then and never ever touched her again. She carries a DPM gun with low pen values relegating her to a support role instead of the alpha damage category that many would prefer. Did the fact that you spouted racist slang on the forums and got a ban make you a bad person? Or were you a bad person who predictably did what a bad person naturally does? No hurry, I can wait until your ban is over and you can come back to respond. Will be playing Frontlines in the meantime. My latest chick crew and Claws are in my Skoda t50. Another girlie crew drives an fv4005. Rip me.